The neighbourhood described as Borden Farm-Stewart Farm-Parkwood Hills-Fisher Glen-Stewart Farm-Parkwood Hills-Fisher Glen is bounded by Meadowlands Drive to the north, and by Viewmount Drive, Coolspring Crescent, and Valley Ridge Street to the south, Fisher Avenue to the east, and Merivale Road to the west. 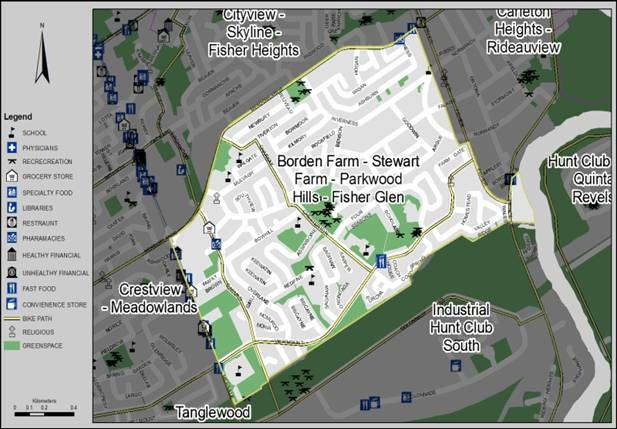 As of the 2006 census, Borden Farm-Stewart Farm-Parkwood Hills-Fisher Glen had 10,177 residents. The population consists of mainly young and middle aged adults, with many seniors residing in this neighbourhood (Ottawa average: 10%). The distribution across age groups was as follows: 8% were children under 9 years of age, 12% were youth aged 10 to 19, 27% were young adults aged 20 to 39, 38% were middle aged adults aged 40 to 69, and 15% were seniors aged 70 to 89.
were recent immigrants (i.e. came to Canada between 2001 and 2006). 34% of residents aged 15 and over were first generation immigrants, 20% were second generation immigrants, and 46% were third generation or higher. Among the immigrants, 43% were from Asia or the Middle East, 7.9% were from Africa, 7% were from the Caribbean, 3% were from the United States, 37% were from Europe, and 1% was from South or Central America.